PM Modi after dedicating Pakyong Airport in Sikkim on Monday attacked the previous Congress governments of neglecting the northeast. A day after Prime Minister Narendra Modi claimed his government dedicated 35 airports in last four years, the Congress on Tuesday described it as "new rhetoric of fake credit seeking" and said that the government had inaugurated only seven airports in the last four years. "Modiji's 'new jumla' (new rhethoric) of 'fake credit seeking' - 35 Airports built in last four years. Total airports inaugurated in four years - seven, new airports - zero," said Randeep Surjewala. "Sikkim Airport was approved by Congress in October 2008, 83 per cent work completed by May 2014. Took Modiji four-and-a-half years to complete 17 per cent," Mr Surjewala said in a tweet. PM Modi after dedicating Pakyong Airport in Sikkim on Monday attacked the previous Congress governments of neglecting the northeast and said that in the last four years his government has opened 35 new airports. "Today, it is not only a historic day for Sikkim but also for the country. 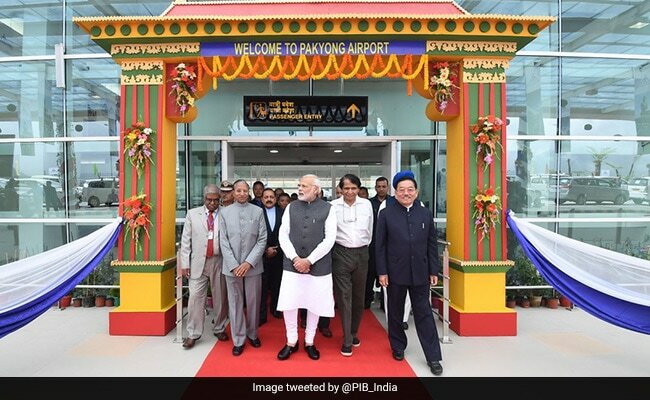 After the inauguration of the Pakyong airport, the country has got its 100th airport," PM Modi had said after "dedicating Pakyong Airport to the nation in Sikkim." "After independence till 2014, we had only 65 airports. That means in 67 years they (Congress) developed only 65 airports, less than one airport in a year. But in last four years we dedicated over 35 airports. That means about nine airports every year," PM Modi said.